Queen Amelia, the last Queen of Portugal, was born at the Orléans residence in Twickenham, near London, on 28 September 1865, and was baptized on that same day as Marie Amélie Louise Hélène. She was the eldest daughter of the Count and Countess of Paris. Nobody could have imagined what fate had in store for the little girl: her difficult life as Queen Consort living in a country whose people held contradictory feelings about the monarchy and the way she witnessed the murder of her husband and son. All this made me see Queen Amelia, who was born in exile (England) and who died in exile (France), as one of the most interesting and inspiring European queens of the 20th century. 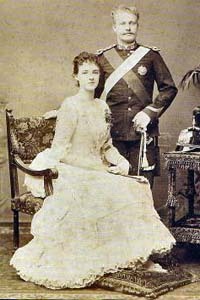 In 1864 Prince Louis-Philippe d'Orléans married Infanta Isabelle of Spain. He was a grandson of King Louis Philippe I of France and had become heir to the French throne in 1842 when his father, Prince Ferdinand-Philippe, died in a carriage accident. Infanta Isabelle was born in Seville, the daughter of Antoine, Duke of Montpensier, and Infanta Luisa Fernanda. Antoine was the youngest son of King Louis Philippe I; therefore Amelia's parents were first cousins. Although this seems strange now, intermarriage between royal cousins was a common method of forming political alliances between countries. Amelia had three brothers and two sisters. Two of her brothers, Charles Philippe and Jacques, died in infancy. Princess Amelia, who considered herself a second mother to her little siblings, was very shaken by these deaths. But with the birth of her little sister Louise in 1882, new joy was brought into the family. The relationship between Amelia and her father was close, and they shared a love of horses and nature. Her relationship with her mother could be tense. More than once, Princess Isabelle slapped her daughter in front of others when she thought Amelia's answers weren't polite enough. Amelia learned a very valuable lesson from her mother's treatment of her, and many years later she treated her own children with the love and compassion that she did not receive as a child. Considering this difficult relationship, it is not surprising that little Amelia adored spending vacations in Spain with her beloved maternal grandfather, the Duke of Montpensier. In 1884 during a tour of Europe, Amelia and her family visited King Alfonso XII of Spain, Amelia's uncle. This visit was a milestone in the princess' social life, and the foreign press praised her beauty and her elegance. But Amelia's social debut came later in the tour, during her visit to Vienna. Archduchess Marie Valerie, the youngest daughter of Emperor Franz Joseph, invited her to go to a play, where she was sitting in the imperial box at the theater. Amelia accepted the invitation, not knowing that she would meet the Emperor face to face in the box. The Emperor invited her to sit at his side, which caused amazement all over the theatre; the entire audience looked at the shy and embarrassed Princess. The princess visited the Belvedere, walked on the Prater and was delighted with all the novelties. After Vienna she ended her trip in Munich where she met a Bavarian prince who would propose to her a few months later. His proposal was refused; the memories of the French-German war of 1870 were still too fresh. In 1884 Duchess Clementine of Saxe-Coburg, Amelie’s paternal aunt, visited the royal court in Lisbon, where she praised the qualities of her niece Princess Amelia to Queen Maria Pia of Portugal, and also showed the queen a photograph of Amelia. The heir, Prince Carlos, saw the picture too and was enthusiastic about Amelia. In January 1886, Carlos left Lisbon to meet Princess Amelia in the castle of Chantilly, owned by the Duke of Aumâle, Amelia's great uncle. Before the two met, they had one thing in common already: their birth date, 28 September (Carlos was older 2 years than Amelia). At first sight there was a mutual attraction. During the gala dinner that followed, Amelia noticed that Carlos was agitated and distracted by his feelings for her. She calmed him and returned his attention, thus letting him know that she was not indifferent to him. After this first meeting, Carlos was sure about his feelings, and in a letter to his father, King Luis, he said: "no other creature is more beautiful than her." The couple soon got engaged; the engagement was celebrated in Paris where a grand reception was held in the Princess’ honour. Over 2000 carriages were needed to bring the guests to the palace. When Amelia's father, Prince Louis-Philippe decided to hold this party, he did not expect the repercussions that it would bring him and his family later. The splendour of the festivities annoyed the French republican government, as a result they forbade military troops to be present. The Orléans family had been exiled from France in 1848 and only been allowed to return in 1871. Still the French government was suspicious about the family and saw the public interest in Amelia’s wedding as a threat. The Princess said a heartfelt goodbye to everybody who lived and worked in her parents' home in Paris, and more than 10,000 citizens were present to wave goodbye at the railway station where she departed for her new home. On 19 May 1886 she arrived in Portugal at the train station of Vimieiro. Here she changed into a dress made of blue and white silk and a hat in the colours of the monarchist Portuguese flag. Amelia was not an extraordinary beauty, but her impressive height (5 feet 10 inches/180 cm), her dark hair, and her brown eyes impressed the Portuguese spectators. From the station the Princess and her party went to the Palace of Necessidades in Lisbon. On her wedding eve, Amelia visited the palace chapel to confess and to pray. The royal wedding was celebrated three days after her arrival, on 22 May, in the Church of São Domingos in Lisbon. The day was splendid, the Sun shone, and everyone was on the street to greet the royal family. It was jokingly said that only the sick and the lame stayed at home. On that day, everybody forgot the political differences. In Lisbon, the hotels were filled with guests who came from remote places in Portugal. The church was dazzling, not only because of the blue and white decorations but also because of the beauty and variety of uniforms and gowns worn by the guests. At 2.10 pm the bride arrived at the church with her father. The Countess of Paris followed them and was escorted to the altar by the bridegroom, while the music of Hino da Carta - national anthem of the kingdom of Portugal - was played. Everybody was eager to see Amelia’s dress. She didn’t disappoint them: her white wedding dress was made of faille silk with a long train, and her lace veil was a gift from friends from France. On her head she wore a garland of orange blossom; she didn’t wear any jewelry. After a short honeymoon in the bucolic and romantic city of Sintra, the young couple went to live in the Palace of Belém while Amelia's parents stayed in the Palace of Necessidades. It was at this time that the family heard that they were exiled from France again. The exile was caused by the “extravagant” celebrations for Amelia's wedding, which had aroused royalist feelings in France. The first years of their marriage were happy. 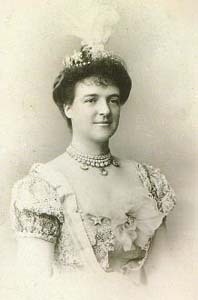 When the Duchess of Luynes, a friend of Amelia, wanted to know if the Crown Princess had found real happiness, Amelia replied in a letter: "I have adapted very well to my new life; my parents in law are so tender to me and the people show me such kindness.” In 1886, Amelia became pregnant with her first child. It was an easy and happy pregnancy, but the actual delivery of Infante Crown Prince Luís Filipe on 21 March 1887 did not go as swiftly. It took so long that the family and the courtiers got frightened. The couple’s first official visit took place in 1887, when they travelled to London to attend the celebrations for Queen Victoria's Golden Jubilee. For Amelia this was an opportunity to meet her French family, who were still living in exile in England. After the ceremonies, the couple left for Scotland. During this trip Amelia's son stayed in Portugal with Queen Maria Pia, and although Amelia missed him terribly she enjoyed the time she spent with her husband. In Edinburgh the couple was able to send good news to Portugal: Amelia was pregnant for the second time. When Carlos and Amelia returned to Portugal they paid an official visit to the north of the country, where they were confronted with a very harsh article in Braga's Comércio do Minho newspaper. The defamatory article used words like "wastrel", "liar" and "cynic" to describe the princess. Amelia was also accused of too much interference in politics and showing fake affection for her husband, son and father-in-law. According to the newspaper Amelia faked her kindness with everybody and especially with the poor and sick. The article caused a scandal, and a group of furious protesters destroyed the office of the newspaper. However, this was only the first negative article about Amelia; many more would follow. For the republicans, attacking Amelia provided a perfect way to attack the monarchy. From the beginning of her life in Portugal, Amelia refused to be confined to a comfortable life in the palace and started her own initiatives. She didn’t want to limit herself to being a mere financial supporter of social institutions; she visited the institutions and interacted with the people there. But her social activity was not always positively welcomed. Many aristocratic ladies thought it was inappropriate for a royal to visit poor neighbourhoods and spend time with the poor, the sick, and the rejected. The republican press used to criticize her for her contact with the poor too. However, Amelia did not pay much attention to these negative comments and became the patron and founder of two very important institutions: the Institute Princess Dona Amelia (which had been created to support the workers' social rights) and the National Association against Tuberculosis. Health care would become one of her lifelong interests, and several decades later when she was living in exile she became a volunteer in the Hospitals of Wandsworth and Whitechapel, helping the doctors and nurses take care of wounded soldiers during the First World War. In France, Amelia was an important financial donor to the Red Cross and to new schools and hospitals. After their difficult trip to the north of Portugal, the family retreated to the Palace of Vila Viçosa. Here, the infant Luis Filipe almost lost his life during a fire, which raged in the palace and more specifically in Luís Filipe's room. Amelia, like any other mother at such a moment, was not frightened by the flames and entered the room and took him out. Perhaps all these evens caused Amelia's second pregnancy to be difficult. In December she felt unwell and her husband called the doctors; however, they could not prevent the premature birth of a daughter, Infanta Maria Ana. The baby would not survive. Carlos and Amelia spent days being unable to talk to each other about their loss. Amelia was devastated; it was only when her mother and her sister Helene came to stay with her that she began to recover. Her chronic heart problems date from this episode, and she never fully recovered her physical health. By 1888, the health of King Luis was deteriorating. The doctors decided that the monarch should take some time off and go on a boat trip through Europe. During his absence, Prince Carlos assumed the regency of the country. This gave Amelia a taste of her future role as Queen. The regency was not free of political and personal attacks; newspapers criticized Queen Maria Pia for shopping and visiting her friends all over the European courts while her husband the King was travelling alone and sick. Carlos's love affairs become another source of scandals, while Amelia was accused of being vain and too concerned with French fashion. The year 1889 had a happy beginning for Carlos and Amelia; they spent several weeks in Spain, where they both spent their time hunting, one of Carlos's favourite hobbies together with oceanography. This vacation from which Amelia would return pregnant, would be the last carefree time for the couple. King Luis died soon after they returned to Portugal. Amelia thought about her mother-in-law, Queen Maria Pia, and wrote a letter letting her know that she would continue to respect her as queen and as mother. When Amelia became Queen, as soon as the phone service was inaugurated in Portugal, she ordered a special a private line, in the Palace das Necessidades, in order to enjoy private chats with her “mother." On 2 October 1895, King Carlos started the first foreign official visits of his reign. He tried to strengthen diplomatic relations with the big European powers. His tour started in Spain, followed by visits to France, Germany, and England. The King's visit to England was especially important as relations between the two countries had gone sour. In 1890 Britain had sent an ultimatum to Lisbon, telling Portugal to give up the territories between Angola and Mozambique. This ultimatum was a source of anger for many Portuguese, who were proud of the large Portuguese Empire in Africa, Asia, and Oceania. As Portugal was bankrupt, the country could not afford a war with Britain and the government had no other option than to bow to British demands. King Carlos, however, seemed to enjoy the company of King Edward VII in England, which angered Portuguese monarchists as well as republicans. Many newspapers called the king “Traidor!” - Traitor. During this trip, Queen Amelia stayed in Lisbon and acted as regent, a responsibility she found difficult to combine with her private life. Since Amelia was both Queen and acting Head of State, protocol rarely allowed her the luxury of being alone.